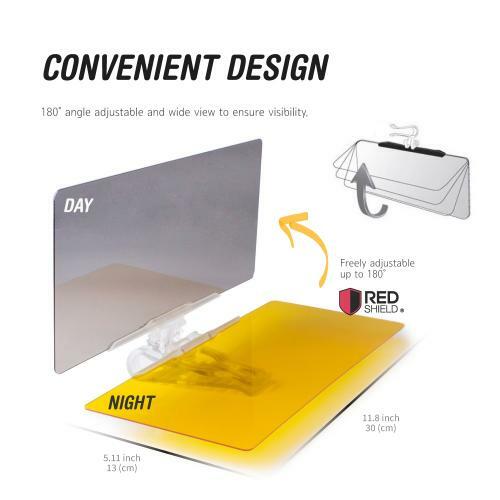 AccessoryGeeks.com | Universal HD Vision Anti-Glare Car Sun Visor - Protects From Heat And UV Rays! | Free Shipping! 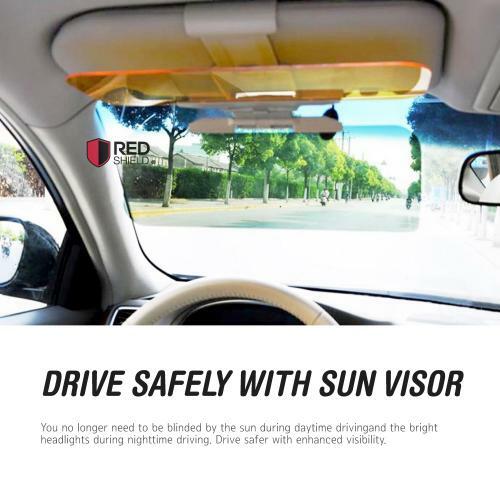 RED SHIELD Universal Car Sun Visor Extender. Transparent, Tinted Shields for Day & Night. 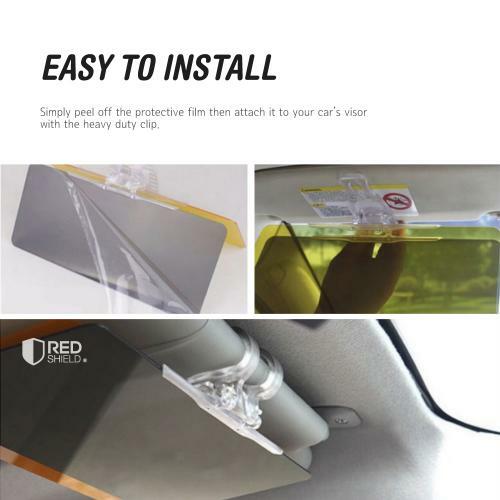 RED SHIELD Car Sun Visor Extender. 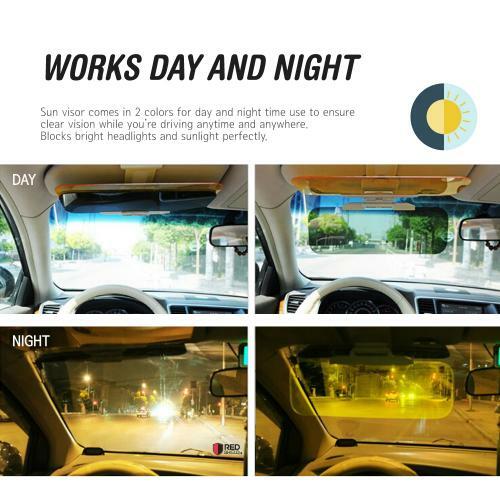 2 Transparent Anti-Glare Tinted Shields for Day and Night. Blocks UV Rays Through Windshield. Universal for All Vehicles. Drive Safely with Enhanced Visibility. 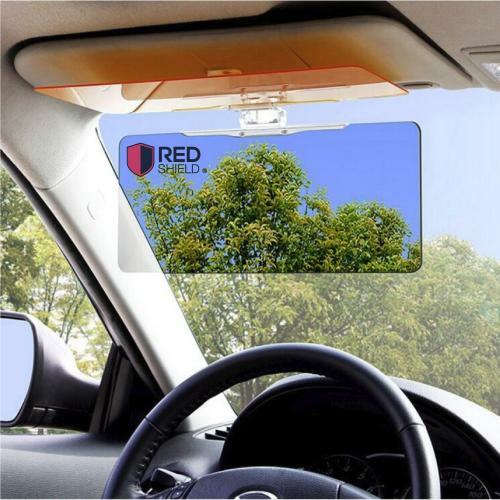 RED SHIELD Universal Car Sun Visor Extender. Transparent, Tinted Shields for Day & Night. Reduce Glare from Sunlight & Oncoming Headlights Through Windshield. Drive Safer with Enhanced Visibility. Exactly what I wanted. The glare blocker filters works so well and used it everyday! Especially driving at night meeting brighter headlights. Helps better than just the regular visor for the bright sun. And I found it even more useful on a longe distance roadtrip driving at night. Worth buying! Works as described. I have seriious night vision issues and have anti-glare on my eyeglasses and it's definitely a big help for me. Reduce the glare drastically and more comfortable driving! Absolutely love this can sun visror. Super easy to install, it stop the sun light, and enhance my vision while it is dark or foggy. Stores out of the way when not in use. We went on a long trip and my husband was able to use both the day & nite visors. He absolutely loved how well both worked. It made it so much better to see. My wife is completely happy with its flexibility. This is very easy way to add an extension to a sun visor without needing to do anything invasive. It has worked like a charm! Did a good job of reducing the night glare. The day shield was wonderful and no need to wear a sunglasses during the day. Thanks Geeks! My mom and I take trips and the sun can be our worst enemy. I purchased these sunvisor to help with the sun proble and nights glare from cars. Amazing! Wonderful sun visor! Definitely helps with the sun's glare and the night visor is very helpful with oncoming headlights. No need for sunglasses anymore! I was really looking forward to using this in winter when the light is so bright that you need sunglassed almost on any sunny day, also my night vision is much better. Works great! Exactly what I was looking for. Both screens were very clear and it worked perfectly. It helps to across any unexpected lights/glare. Extremely pleased with this sun visor. Very helpful day and night use! This sun visor works great and really reduces the sun glare. I got one for my wife and myself. Highly recommended. I like it so far, specially when I driving night time. I don't have any more problems with the highlights, no more burning eyes. Many thanks! Works great! It was easy to install, just clip it on your cars visor and that's it. The sun blocker panel was very clear and well constructed. It's such a relief to have the glare guard to look through traveling west at the end of the day! Easy installation and it's an inexpensive addition to your car. Super easy to install and it worked great! My husband loves this, great night driving and in the day when the sun shines right in our face. Wonderful visor! Definitely helps with the sun's glare and night visor is very helpful with oncoming headlights. It works like a charm, especially at night. Exactly what the eyes needed. Daytime sun glare and nighttime headlights aren't a problem anymore. The twin visor extenders work nicely in improving my vision for safety. It helps to see the reflections of street lines and reflectors on the street along with signs. The shade protects the eyes from solar rays and provides a great view. This is a really nice addition to driving. Both visors fold easily without interference. Keeps the light glare and helps me during the day, easy to adjust the grip to my car visor. Works well and one of the best features is the way it connects to the visor. I even bought one for my grandmother and she says she can't drive without it anymore. My mom and I take trips and the sun can be our worst enemy. This sun visor is amazing! So easy to install and really cuts down on the glare from the sun! I bought this for my husband and he really likes it no glare when he is driving. Blocks the sun rays and brighten the road beautifully! It seems sturdy and it works great. I like it so far, specially when I driving night time I don't have any more problems with the highlights and no more burning eyes. Wonderful item. It really helps during the night. Helps to see the reflections of street lines and reflectors on the street along with signs. Very useful product! Wonderful item! This thing has made driving very pleasant. It comes in two shades, the dark one and a yellow one. Makes my night driving safer! What a nice difference! To blocks the sun! I drove both this morning and early evening right when the sun was in the glare spots and it blocked them. 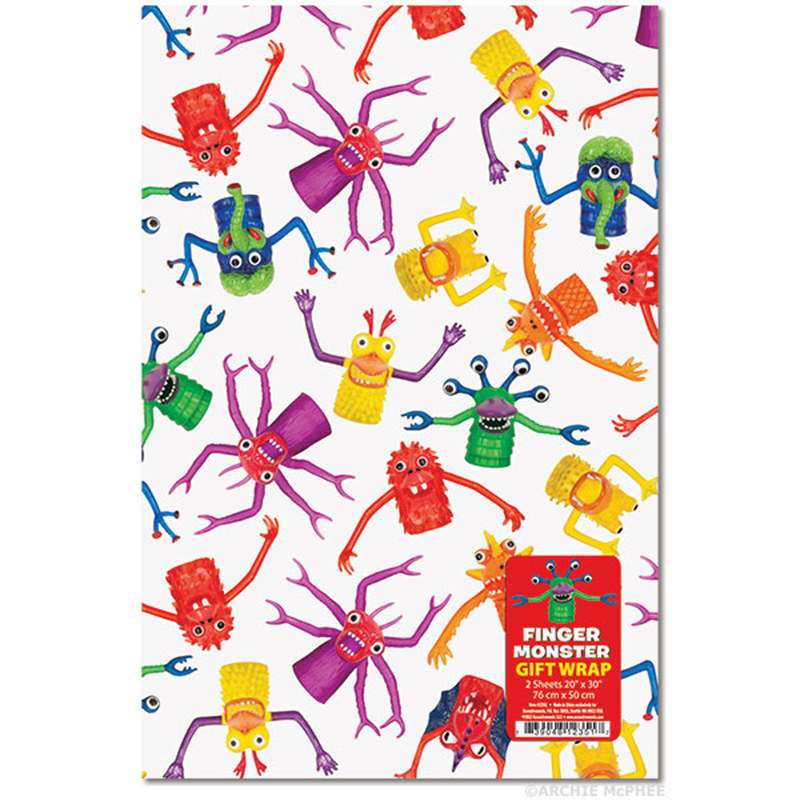 Great product and works as advertised. Installs in seconds and I love the day and night shades. Didn't have to wear my sunglasses! Works great when I am driving into the sun. Also, when the sun strikes a different angle. It can be flip down and still see what's going on. Does a good job! It all works well! This visor shield is incredible. I use both the sun glare blocker and the night driving glare blocker. 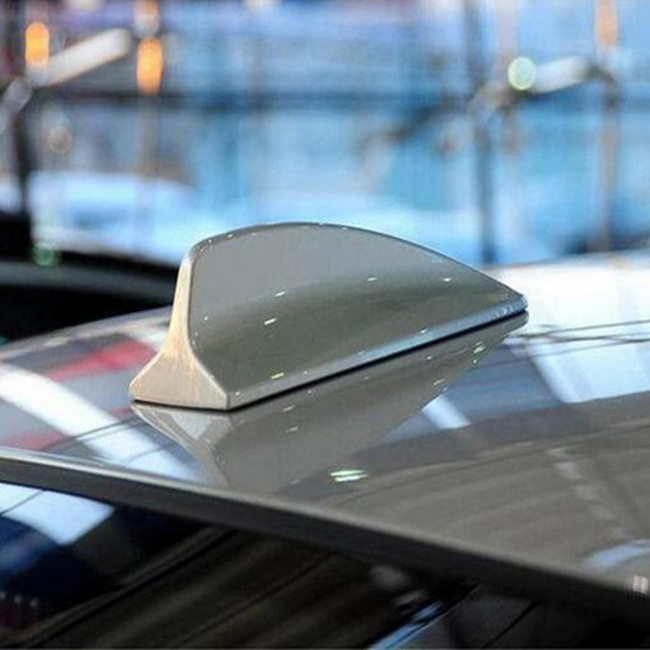 The gadget attaches to a car visor. Thanks! Definitely helps block sun glare and makes me feel much safer on the road! We love this thing and are going to be putting them in all our car's. Wonderful sun visor! Perfect for my husband when he's driving home after work with the sun shining in his eyes. It really helps lowers the glare from oncoming vehicles. Perfect visor in all respects. Installation was easy and the clarity and optics are flawless. They are effective in cutting glare and improving vision as described. Buy with confidence! So easy to use! It does exactly what it is designed to do. Easy to install and easy to go from one car sun to another. This thing has made driving very pleasant. Wonderful visor! Definitely helps with the sun's glare and the night visor is very helpful also. I can drive and see better now it's blocking the sun directly! 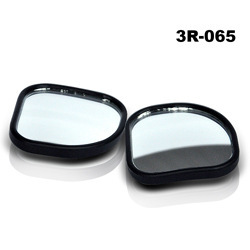 Works much better than visor with just a clip that makes your vanity mirror unusable. This is a night shiftier and extremely very useful. Awesome for removing headlight glare! Love the day and night shades! We used it this morning on a trip heading East on the interstate facing the sun and it worked great! Just a clip that makes your vanity mirror unusable. Thanks! Exactly what I needed to keep the sun out of my eyes when it shines in below my car visor. No more having to hold my hand up so I could see to drive which I felt was most unsafe. Well designed and it protect my eyes. This visor hangs below sun visor where you need it and folds up when you don't. Also, have a night driving yellow and this super great! Awesome! This sun visor is great help when the sun is directly in my eyes. This visor blocks out the rays without blocking the view of the road. I have used this product so far for two weeks. So easy to use! It does exactly what it is designed to do. Easy to install & easy to go from one car sun to another. Well designed! 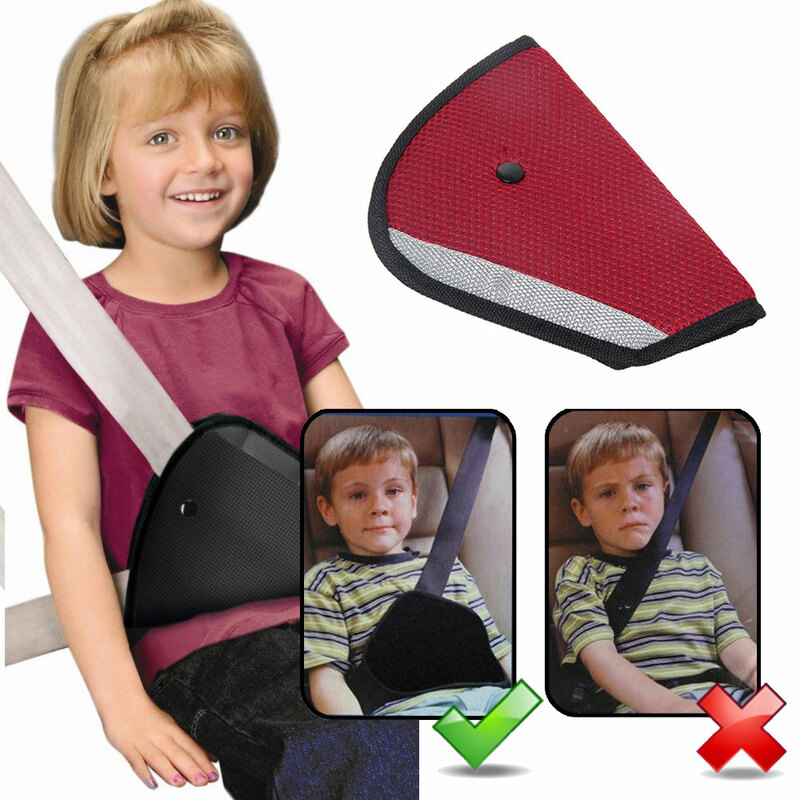 This sun visor hangs below your sun visor where you need it and folds up when not in use. And great night glare driving definitely a life saver! This sun visor shield is incredible. I use both the sun/glare blocker and the night driving glare blocker. It all works well. It comes wit two shades, great when driving right into the sun. And, the yellow used for night driving. Makes my night driving safer. Thanks! Great to reduce glare while driving. It works really well for night time and day time while driving. It makes a huge difference! Wonderfull item! It really helps during night. Also, the shade protects my eyes from solar rays and provides a great view. Easy to install and it works great! It seems a big help with not getting tired eyes. Taking a long trip soon and looking forward to not having eye strain. Makes a huge difference! 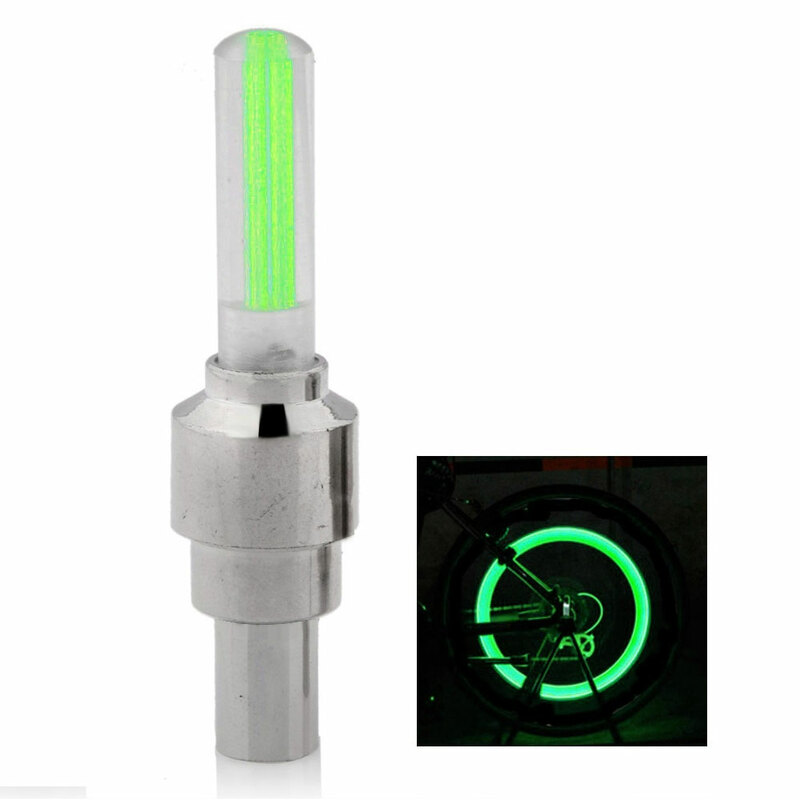 Really helps during night to see the reflections of street lines and reflectors on the street along with signs. The shade protects eyes from solar rays and provide a great view. It works well! This visor shield is incredible, I use both the sun/glare blocker and the night driving glare blocker. I want one in all my vehicles! Wonderful! Helps to see the reflections of street lines and reflectors along with signs. The shade protects the eyes from solar rays and provides a great view. I'm prone to migraines and this things works great. I like that I can switch between the two colors. It's a God send for driving into the sun. Many thanks! I got this sun visor for my new truck. 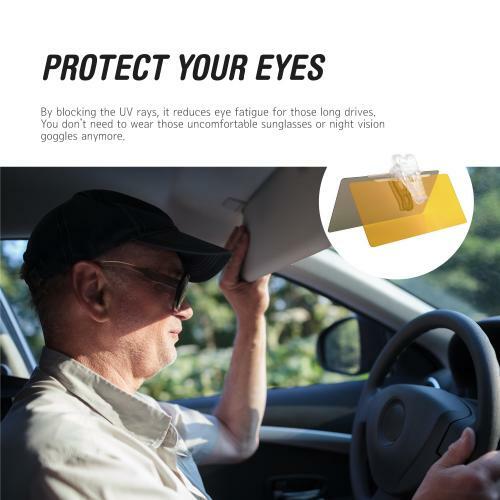 It is pretty easy to install and really does help block out the sun and improve visibility when driving in direct sun. Finally! I'm so thankful for this product. I hate to drive in town at night with all the lights and this things is a big help. My wife is looking for a sun visor like this. It makes her life easier with the sun filtered where the visor is not wide enough. Easy to install and very helpful. Finally, my eyes just can't handle glare and bright sunlight. After using this visor it helps ease my eyes. I am so dependent on the visor while driving on a bright sunny day. Easy to attach and it makes viewing much better! It helps a lot when I take my kids to school in the morning, the sun hits my face and decided to buy this. Awesome! Perfect visor in all respects. Installations were easy and this product is very well made design. They are effective in cutting glare and improving vision as described. Wonderful sun visor and it really helps during the night. The shade protects my eyes from solar rays and provides a great view. Very well constructed and Helps with the glare of the sun and at night time as well. It is a bit large but is necessary for coverage. I have very sensitive eyes. This is what I am looking for day and night anti-glare visor. It has made a huge difference while driving. It works well with glare and I don't need sunglasses. I use the yellow one mainly I can see so much better and the clarity is great! Just what I needed at a great price. It is much more than plain colored plastic. Great sun visor night and day in one compact unit. Amazing! I can see the difference using this yellow sunshade compared to driving without it. I want one in all my vehicles! Just what I needed at a great price and works great! I really like the night vision visor. It helps cut the glare of headlights. Really blocks the sun well and I leave for works just as the sun rises so I need the protection. Good product for the price. Due to my eyesight issues, my night driving declined drastically due to headlight glare. And this visor shield does help for blocking headlight driving glare. Incredible! Very helpful day and night use. 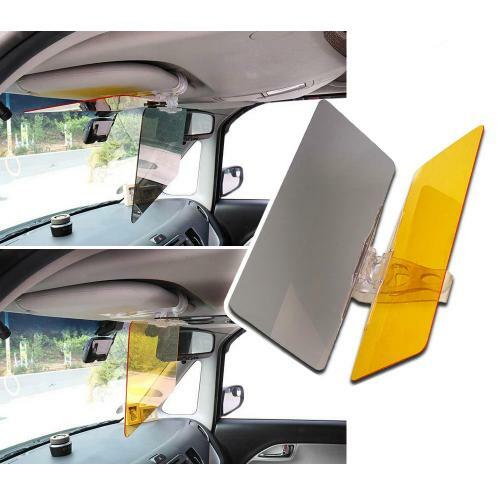 It's easy to install and allows both visors to work while driving. Thanks Geeks! I really like having both the sun protection and the evening glare protection. Great little gadget that includes an orange side for night glasses. Very helpful and functional for day and night! Great for those times I forget my sunglasses or on heavy interstate at night to negate the headlight glare. Awesome! Great visor! It works well with glare and I don't need sunglasses I use the yellow one. Mainly I can see so much better and the clarity is great. Perfect for day or night! I really like having both the sun protection and the evening glare protection. 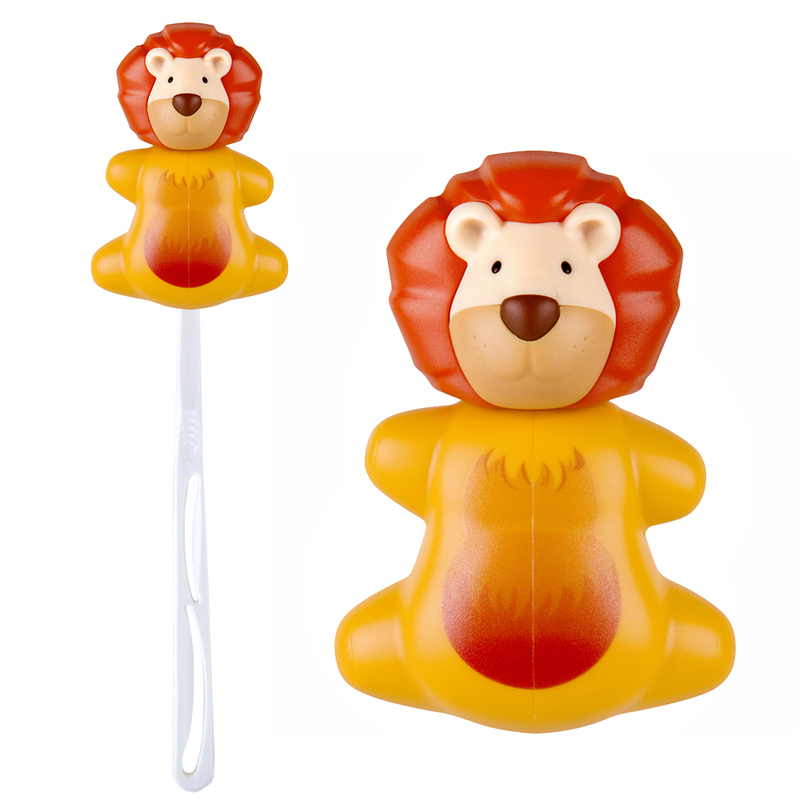 The product is well made, easy to mount and to remove. Great sun blocker. Great idea! Very good item, easy to use and it works find because the sunlight is blocked. Keeps the hot sun from hurting my eyes. Absolutely love this product! Definitely helps block sun glare and makes me feel much safer on the road! Highly recommended. Perfect sun visor in all respects. Installation was easy. The product is very well made and the clarity and optics are flawless. I'm very happy with my purchase and but it with confidence! I use the smoky lens almost every day. I like that it includes an orange side for night glasses. Highly recommended. Perfect! Great idea. Its really cuts the glare and for me it's just perfectly lined up with my vision. Great for protecting my eyes through sun killer heat. Awesome! Just the right size and it does the job of shielding the setting sun while allowing see through. The shade was perfect and easy to use. Happy I bought this sun visor! It works very well, specially this summer season. Easy to install and works as it's purpose. Love it! Fantastic eye protector! It protect my eyes from heat and UV rays while driving. 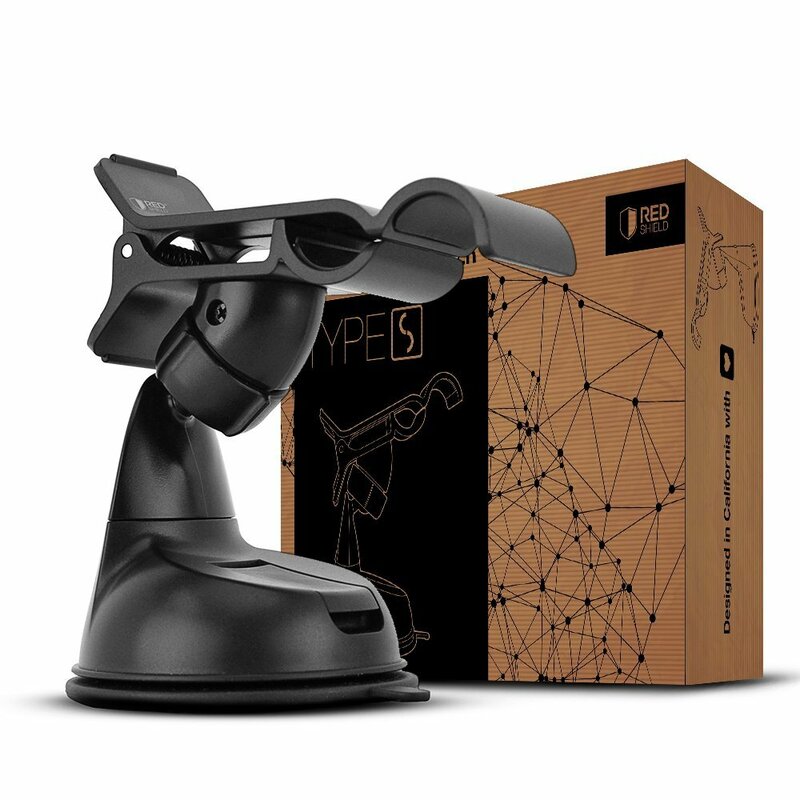 Excellent design, very functional and good quality. Fold if not in use. Perfect! Works well, the coolest car accessories I've ever purchased! Cuts the glare from sun and night time glare from annoying headlights. I'm getting one for the passenger side now! Works great while driving! It has helped a lot of the freeway for the side window to block the sun while driving. Reasonable price. Well made product. Provides large area coverage & performs as advertised! You're reviewing: RED SHIELD Car Sun Visor Extender. 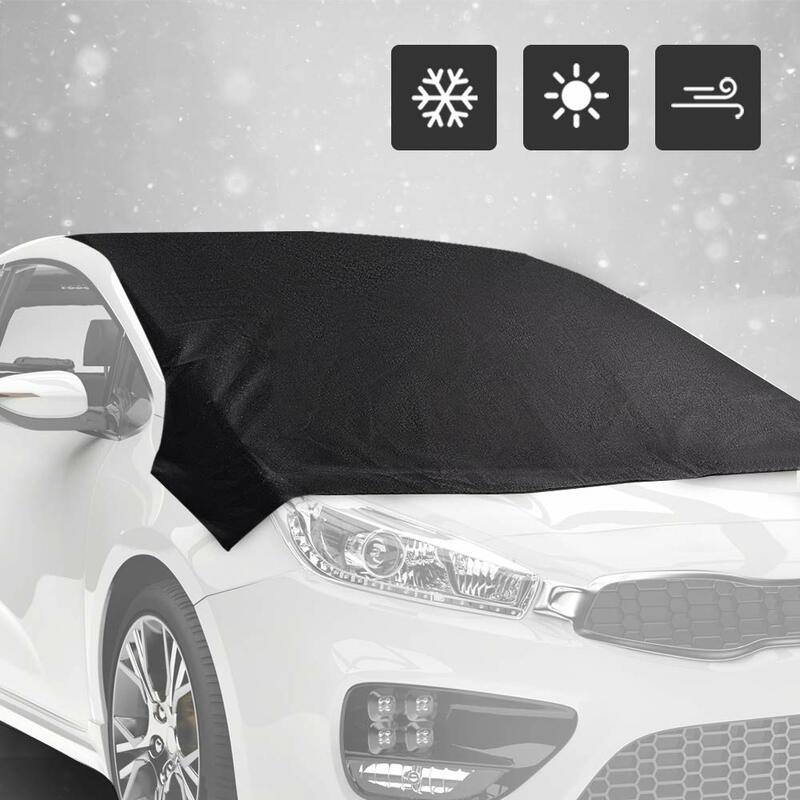 2 Transparent Anti-Glare Tinted Shields for Day and Night. Blocks UV Rays Through Windshield. Universal for All Vehicles. Drive Safely with Enhanced Visibility.